Applications for the 2018 artist residencies at the Joseph A. Fiore Art Center at Rolling Acres Farm in Jefferson will open in early December. Over the course of the summer the Center will host six visual art residencies (five for Maine artists, one of which is reserved for an indigenous Maine artist; and one for an out-of-state or international artist), one performing arts residency, and one writing residency. There will also be a seasonal position for a resident gardener with an affinity for the arts. Those interested can find more information and application details online at https://www.mainefarmlandtrust.org//jaf-art-center/. This will be the third summer that the Fiore Art Center has offered a residency program. David Dewey and Anna Witholt Abaldo, co-directors at the Center, are excited to be working with yet another excellent jury panel. “Because we are introducing a different writing residency this year, and a completely new performing arts residency, we searched for professionals with experience in these fields who also possess a strong visual arts background,” explains Witholt Abaldo. The jury panel for 2018 will include Ariel Hall, Stuart Kestenbaum, and Susan C. Larsen, Ph.D. The mission of the Joseph A. Fiore Art Center at Rolling Acres Farm is to actively connect the creative worlds of farming and art making. The Center’s purpose is to continue and evolve the dialogue between human and environment within the context of our current culture and time. 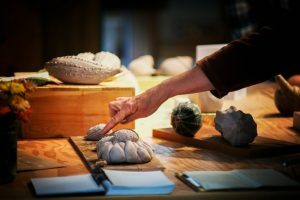 It offers exhibitions and public educational events, it engages in research and development of new farming practices and hosts residencies for artists on a working farm in Jefferson, Maine. The Fiore Art Center is a program of Maine Farmland Trust. The late Joseph Fiore was an artist and active environmentalist who, with his wife Mary, generously supported Maine Farmland Trust for many years. To learn more about applying for these residencies, click here; to learn more about the jury panel, click here.